Here is a a way to recycle all those old fluffy worn out socks, the ones with a hole in the toe! Make a sock bed to fit a cat or small dog. Your pet will love it! 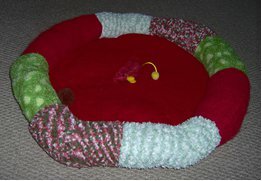 Cut 2 - 18” circles out of the felt (can make larger for larger pets). Cut 1 – 17 ¾ “circle out of quilt batting. Stack the circles, felt on top, quilt batting in middle, felt on bottom. Sew a seam stitch around circumference of circles ¼” from the outer edge. Set aside. Lay each sock flat and cut 1 ½” off the toe* end. Leave the heel on, it helps curve the circle. Turn the socks inside-out, seam one cuff to the other lower foot area together mixing colors for a design, until all are joined and you have a long tube. Leave the end of the tube open for stuffing. Pin the tube to the edge of the felt circles about ¼ “ inside the circumference all the way around and sew the sock tube to the felt circles using quilting thread for a sturdy seam. Stuff the open end of the sock tube until solid and puffing up for a pillow for your pet. Sew the stuffing seam together and put in your pet. Your reward: Purrs or Wags! *Toe End Sachets – fill the toe with dried rose, lavender, or magnolia petals wrapped inside a thin piece of batting and sew the open area together. Throw these in your drawers. Fabulous idea. I love this. A great way to use up those socks that your washer seems to have ate the mate. This sock bed is so quick and easy with this tutorial for even a beginner to make and your kitty or fideo will love you for making them one. I am going to make a bigger one for my dog by keep adding the socks until I get it big enough and hope he likes it. We bought him a bed and he will not use it. I hope this one works. I want to thank you for showing us how to do this.You also explain it very easy for me to understand. This is one that i will be doing. You will hear from me soon. Thanks! This is simple yet brilliant idea. I am looking for pet related knit/sew projects to help raise funds for a local animal shelter where i volunteer. If you're making a bed for a cat, instead of making a sachet, take one of the toes and fill it with catnip and put it in the stuffing. Leave a velcroed opening on the bottom of the bed to change it out. It's a great idea but what about an old towel for the middle? I was wondering bucause my dog s have long nails and dig in the beds to fluf them up they tear holes in them.so I fiugre they need something stronger.so could I use an old towel for the middleand the missmatched socks on the ends to make the top . This would be a perfect use for some of the orphan socks where the washer has eaten the other one! love this idea - I am going to make a small one for my guinea pigs! Terrific idea! One could also use an old pillow filled with washable material for the middle! I love it! Thanks! This is absolutely adorable! I have been looking for a bed pattern for my little dogs, so Fawn and Peanut will love these come their birthdays. Thanks so much for being so creative and sharing with us. This is great. If you do not have the socks, you could go to a second hand store and find some. Also, you could probably find a fake fur item or something soft (like housecoat, blanket or anything big enough) to make the main part. Ideas are endless and your cat or dog will love it. Our dog loves putting his head on the soft edges where the socks are. My kitties will love this little bed almost as much as I do... great idea! I just thought this was great! Simple enough for my niece to make for her cat. Thank you! This is cute. Polar Fleece would also be good instead of felt. You could also make the Toe End Sachets filled with catnip and throw them to your kitties!